The rare sequel that is just about as good as the first one, this movie does not disappoint with the action, storyline, or way that it expands on the mythology. An excellent movie that definitely rivals, and in many ways even surpasses the first film. John Wick Chapter 2 has the better overall story and it does exactly what one would hope the movie would do, after that fantastic first film. It expands on the mythology of the underground society of assassins. The coolest thing about the original film was the Continental Hotel. This sequel takes the ideas around that and runs with them. It really fleshes out the intricacies of how the place operates. It also gives Wick a cool mission that puts him in Rome. There’s a lot to like about this movie and it really has fun with building onto what the first film did, and then spinning the ideas out into new directions. John Wick Chapter 2 is a very cool action movie. It’s just about as good as the first movie, which is very impressive since both films are excellent. There aren’t very many sequels that are better than the first movie, unless the first movie wasn’t especially great. Look at Aliens and Terminator 2. The sequels were a thousand times better than their predecessors, but that’s because the first movies were just okay. In the case of The Godfather, there’s an argument to be made for which movie is actually better. And that’s really it. The list of amazing sequels that are better than the first movie ends there. Sequels are a tough business because on the one hand, the audience wants more of the same (meaning they want to be reminded of the first movie,) but on the other hand, the audience wants something new. They want the next chapter and for the story to evolve. John Wick Chapter 2 finds the perfect balance of that and delivers. This movie works because it really does expand on the story of these assassins and their world. The John Wick story is one of mythology. Here you have this man who is a legendary assassin. He has killed more people and escaped death so many times, that he’s even got a massive list of nicknames and tales told about him. He’s got these stories of things he’s done that make people terrified of him, (killing three men with a pencil, for example.) And all of this came out in the first movie. The man, the myth, the legend. That first film was about giving us a revenge movie (like Taken or the Equalizer,) and then hinting of a larger world of assassins. It was that larger world which made the original film so unique. But we only got hints and wanted to see so much more. In the sequel, we get to. The sequel is the movie about that larger world. In many ways it is indeed better than the original film. The story is better. Thr mythology element of these different factions that make up the underground society of assassims is better. The characters are better. But the action and style are not. The effort is there, but the actual stunts aren’t nearly as thrilling. Regarding the storyline, this one does exactly what everyone was hoping a sequel to the first movie would do. It takes the coolest concept of the first movie, The Continental Hotel, and expands on it. It shows us how this world of assassins is able to exist without everyday people taking notice. The movie even introduces us to another legion of assassins, besides the continental institution, known as the High Table. 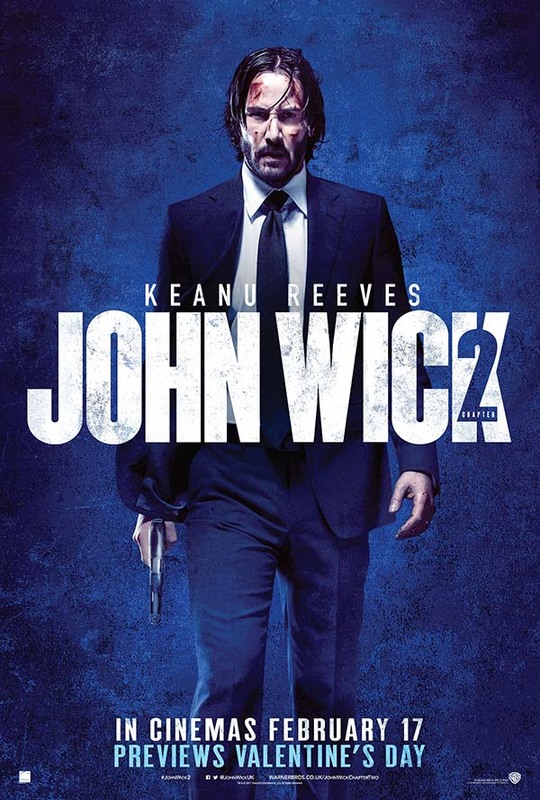 John Wick 2 opens with a continuation of the first film. Like the follow up to the Bond movie Casino Royale, this sequel continues with pretty much the same mission that the first movie ended on. It begins just minutes after that first movie ended with. That film was a straight forward revenge movie with Wick going after all the people who messed with his quiet and peaceful life. He killed them all, and that was it. That was the extent of the movie. And this sequel begins with him going after the one thing he still hasn’t gotten back yet. His car. 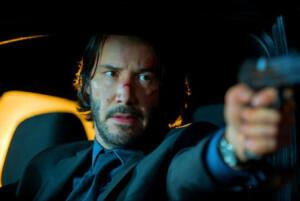 The opening action scene moves from a chase on the night time streets of NY to a garage where Wick uses cars as weapons. The action in this scene is very cool and unique, and on top of that, you’ve got Peter Stormare in an upstairs office telling stories about Wick with great hilarity. The cuts back and forth between the action downstairs and Stormare telling these stories and looking terrified upstairs, are all fantastic. And then we get launched into a new story when a man named Santino arrives on Wick’s doorstep. Santino is the one who helped Wick get out of the game, once upon a time. Apparently there was an impossible task, and Santino made Wick sign a blood oath contract, that Wick would have to pay back at another time. The oath states that Wick owes Santino a kill. It is kept inside of a special coin. As Winston, (A fantastic Ian McShane,) the manager of the Contintntal Hotel in NY tells Wick, there are only two rules to this line of work they are in. You don’t kill at the Continental, and you follow through on your oath contract. Still, it takes some time for Wick to decide to accept Santino’s mission. After getting his car back, Wick buries all of his weapons again and pours concrete on top of them, cementing them into the floor. No sooner does he finish then does the doorbell ring. Santino is there, telling Wick that if Wick had stayed out of the game, Santino would have respected that. But since he put himself back in it, by going after the Russians in the first movie, Santino has decided to call Wick out on the blood oath. But despite this reasoning, Wick still hesitates. That’s when Santino pulls out the big guns. Literally. He blows up Wick’s house. He wants Wick to know that he is not playing around. Santino doesn’t kill Wick, because he still needs the job done, but by blowing up the house he is sending a message of how far he will go if Wick does not honor the contract. And so Wick does. He goes to Rome to kill Santino’s sister and fulfill his oath. This is where we get the preparation scene of Wick meeting with a gun sommalier and talking about different types of guns as if they are bottles of wine. We also get Wick staying at the Rome Continental Hotel and meeting the men who run this establishment. He goes to a music venue inside ancient tunnels and ruins, where he finds Santino’s sister, Gianna. 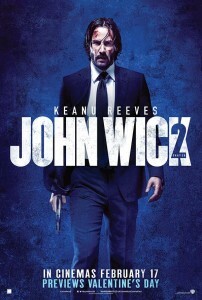 Wick fulfills his mission, but this only leads to lots more violence. Suddenly he is having shootouts in the underground catacombs. Then he is fighting an assassin played by Common on the streets. And lastly, it’s Santino’s own men, (or in the case of Santino’s number one henchman, a woman,) shooting at Wick. They want to kill him too, probably to cover up the fact that Wick killed Gianna for Santino. All of this leads Wick to going back to New York, with Santino putting a huge contract on Wick’s head. Now we are into the third act, and it’s all out warfare. Wick faces assassins everywhere he looks. He turns to a man named the Bowery King, (Fishbourne,) for help. This brings us into a whole new group of organized assassins. There have been comparisons made between this movie and the classic Walter Hill movie The Warriors, where a gang has to make its way through the streets of New York while fighting off tons of other gangs. The comparison is pretty valid. Between the Continental, the High Table, and now this group of homeless people who work for The Bowerey King, there are quite a few groups out there, and Wick needs help navigating some of them. All of this makes for a pretty large playing field. It’s just what this movie needed. Each new act of the film brings us deeper into how everything works. The new additions are creative. And on top of that, one area where this movie really surpasses the original is in scenery. From the catacombs and concert in Rome to the Oculus subway station in NY, to the MET Museums modern hall of mirrors, (taking the climax from Enter the Drsgon up a notch,) these are some pretty amazing settings. And to have this level of action set to these surroundings is just beautiful. These movies were directed by stuntmen who are clearly not playing games when it comes to the kills… all headshots. And if it’s hand to hang combat then when a guy goes down, he still gets back up and keeps fighting, until he truly can’t get up any more. This movie (and it’s predessesor,) right the wrongs that action movies have been making for decades. And then they push everything to the next level. John Wick 2 is another excellent entry in the series, and it most certainly wets our appetite for movie three.